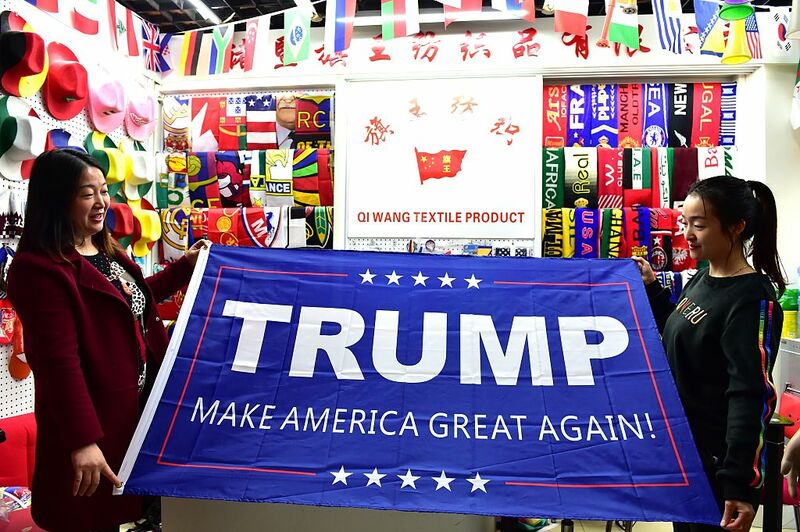 Two women pose with a banner from the campaign run by the U.S. President-elect, Republican Donald Trump, at Yiwu International Trade Centre, in Jinhua, Zhejiang province, November 10, 2016. The U.S. election is over, and Donald Trump’s pundit-defying victory over Hillary Clinton has stunned and surprised people all over the world. In China—where activity on Weibo and WeChat indicated strong support for Trump among netizens both in China and in the U.S.—are elites and the Communist Party leadership happy with the outcome? Or would they have rather seen a Clinton victory, preferring the familiarity and stability that a Hillary Clinton administration would have represented, despite the almost-universal view in China of the former secretary of state as an unalloyed liberal interventionist who hammered China relentlessly on human rights? And what will the Trump victory mean for U.S.-China relations? Will Trump’s fiery anti-China rhetoric on the campaign trail translate into actual policy? Will he hew to his promise to declare China a currency manipulator on his first day in office? Will he go through with threats to slap heavy tariffs on Chinese imports? And will Trump, who as a candidate was highly equivocal on his support for American allies in the western Pacific, give China a freer hand in the region? Finally, how will the Trump victory impact views on democracy? Will it, as James Palmer has suggested, take some of the shine off the city on the hill for young people who admired American democracy, or will it reinforce the idea that the U.S. electoral system really does express the “will of the people”? Isaac Stone Fish, who has written recently about the U.S. election from the Chinese perspective, joins Kaiser in a conversation about these topics and more. Isaac is a senior fellow at the Asia Society’s Center on U.S.-China Relations and formerly served as Asia editor at Foreign Policy. He spent election night with a Chinese constitutional law professor, who by 11:00 p.m. was comforting a horrified Isaac about the strength and resilience of American democracy.